The Black Banded Cat Shark is known as a Cat Shark because the barbels at the mouth look like cat whiskers. 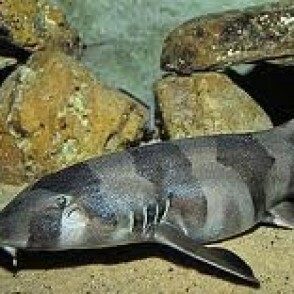 It is also referred to as the Brownbanded Bamboo Shark, and has a cream-colored body with broad dark black stripes. 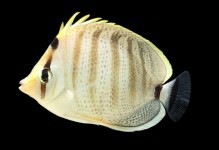 There may be large, muted brown spots between the stripes when the fish gets larger. 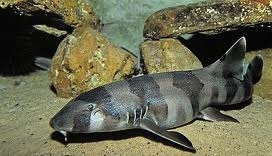 The Black Banded Cat Shark is a bottom dwelling shark that is common in the home aquarium. It will eat any crustacean in the aquarium. 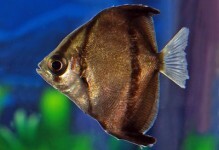 It stays relatively small, but requires at least a 180 gallon or larger aquarium as an adult. It requires sand as the substrate as the abdomen is easily scratched by a coarser substrate, which may lead to an infection. It should never be exposed to copper-based medications. Feeding may be difficult in the beginning. 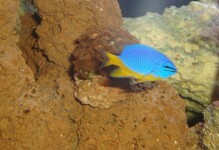 When first introduced into the aquarium, small pieces of cleaned squid or live saltwater feeder shrimp should be used to entice this fish to eat. 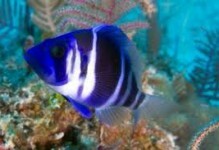 Then it may be fed shrimp, scallops or pieces of fresh marine fish. Feeding these sharks quality foods such as whole cockle in the shell, fresh shrimp and squid, and frozen mussel are ideal.